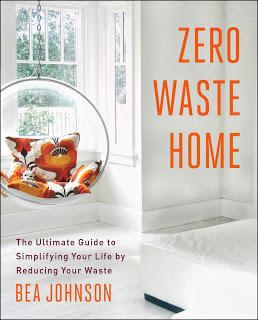 I love Zero Waste Home by Bea Johnson. It is exactly the kind of smart, stylish, practical, frugal, minimalist, conservation home guide that I’ve been looking for. But I didn’t know I was looking for it until I happened to run across a little blurb in Sunset magazine that said that Bea’s family of four only produces one quart of garbage per year. After looking at the inspiring slides and reading the article, I put Bea’s book on hold at the library. I checked out her blog and her top tips. When the book came through after a few weeks, I devoured it in a day. Then I read it again. Zero Waste Home is chock-full of great tips and examples of how Bea and her family have been able to reduce waste, reduce consumption, save money and still live a fabulous and fun life. It is a book after my own heart. I’m so inspired by this book that my next blog posts will detail how I’ve put Bea’s tips to work in my home and in my life. Stay tuned. In the meantime, check out the book! NOTE: The book links on this page are affiliate links, so if you end up using any of them for your own online shopping, Super Frug will benefit (thank you!). A couple of years ago, Marcus and I were analyzing our utility bills, trying to think of ways to reduce them. Then we happened to go on a self-guided solar panel tour of our neighborhood and we met a homeowner/professional contractor who told us about his solar panels but also told us about the Cree LED light bulbs he was putting into his house and other buildings. He told us that the light bulbs he was putting in would last for 20 years. I’m always looking for ways to do something once and end up saving money for years, so when I heard that, a light bulb (pun intended) went off in my head! That day we went right to Home Depot and shopped around for light bulbs to replace a few that had burned out in our stairwell and kitchen. We had no idea that there were such good LED (light-emitting diodes) bulbs on the market! The new energy-efficient LED light bulbs give off light that’s much more pleasing and warm than those nasty, bluish compact fluorescent (CFL) bulbs. 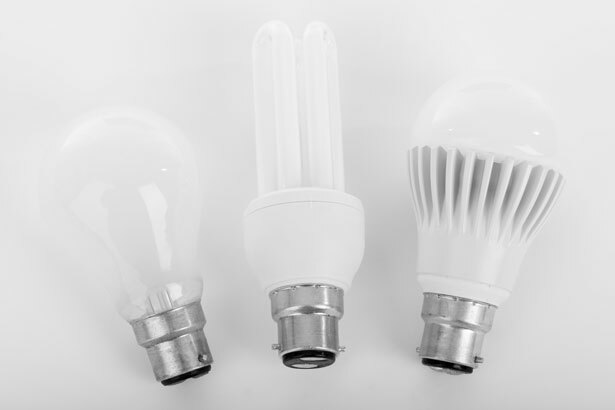 Yes, they cost more than a CFL or incandescent light bulb–quite a bit more–but they also last way longer and they use very little energy–up to 80% less energy than a traditional incandescent. But, how much do they save? According to the U.S. Department of Energy’s FAQs on lighting choices, here’s how much it costs to operate a 60 watt light bulb for 2 hours per day for a whole year. Not only does the Energy Star LED bulb cost only about one fifth the cost using an incandescent, it also lasts about 25 times longer. Can you imagine if your lighting bill was cut down to one-fifth of its cost? Ponder that for a moment and then read this interesting article on MSN.com about how much you can really save using energy-efficient light bulbs. Because we’re Super Frug, we didn’t change all of our light bulbs. We’re waiting for them to burn out first. As they do, we’ll replace each of them with an Energy Star LED. Then we’ll watch our lighting bill go down every month from now until we’re retired…and beyond! Lightbulbs photo by Petr Kratochvil. Can you imagine giving away most of your possessions and then moving into a custom-made 128 square foot house on wheels? 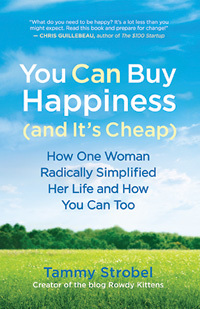 Either way, you should read You Can Buy Happiness (and It’s Cheap): How One Woman Radically Simplified Her Life and How You Can Too by Tammy Strobel. I read this book in two days. I couldn’t put it down. I found Strobel’s journey to simplify, reduce her consumption, and create a life that she loves absolutely fascinating. Her writing is friendly, straightforward, and honest – she shares her triumphs and accomplishments along with her mistakes, misfortunes, and faulty ways of thinking. I really appreciate that. Strobel doesn’t just share her story, she also peppers the book with stories from other happy, interesting, and independent people who have also simplified their lives. Also, she’s done her research. Throughout the book are enlightening and often shocking factoids on happiness, consumption, debt, personal finances and more. This not only an inspiring book, but one with tons of resources for anyone who wants to live a more frugal and intentional life. Whether you would ever live in tiny house is beside the point. This book is worth reading just for all the simplifying, life-altering, happiness-inducing ideas and strategies. Check it out when you get a chance and let me know what you think of it! NOTE: The book link on this page is an affiliate link, so if you end up using it for your own online shopping, Super Frug will benefit (thanks so much!). I’ve joined three different gyms in my 41 years on this earth and each time I wondered, why am I paying to exercise? Still, those three times in my life were the three most physically healthy times in my life. You see, when I pay for something, I want to get the most out of it. So, when I had a gym membership, I actually used the gym. Not a lot, mind you, but a decent amount. Most weeks, I would work out on a cardio machine, use the weight machines and/or take a yoga class two or three times a week. I made myself exercise and stretch and sweat, and guess what? I got into shape! But, I still couldn’t get over the fact that I was paying to exercise. And I just didn’t like the gym culture. Some people love it. They love to work out with other people. They like to have a community of exercisers around them. It motivates them. But despite the beautiful, buff bodies around me to inspire me or give me some eye candy, I just was not comfortable. It did not inspire me. It did not motivate me. I was just trying to get the most from paying for my membership. I keep thinking, maybe I need to join a gym again? But each time I debate it in my mind, I come up with the same answer: NO. So, what’s an out-of-shape Super Fruger to do? I’ve tried working out with free weights at home. That lasts about a week. I also tried riding a stationary bike for six months. It was great except I kept having lower back and neck pain. Out went the bike. I do love taking walks every day. And I do take qigong classes every week and love them. But what about the strength training? Well, I think I came up with an answer yesterday as I was scrubbing the kitchen floor, crouched down on my haunches. This was probably the first time in three years that I have done this (usually, Marcus just vacuums the floor). Let me tell you, when I got up after 30 minutes of scrubbing, my legs were sore. My shoulders and arms were sore. I thought, that was a workout! Then I thought, why don’t I do this every week? With that in mind, here’s my new exercise routine for May. Every day, I will take a 45-60 minute walk. Twice a week, I will attend my qigong classes. 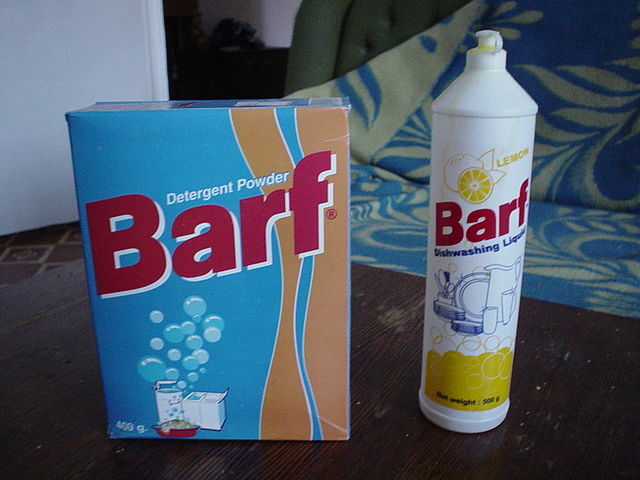 Once a week, I will clean our two bathrooms (toilets, sinks, tub and floor). Once a week, I will scrub the kitchen floor or the dining room floor. Once a week, I will sweep out the front entryway and the front walk. Maybe some of you are thinking, I do all this already. Congrats, little Miss or Mister Housecleaner. Don’t rain on my parade. I’m going to try the “Housecleaning Exercise Workout” for one month. I will put my all into it and try to work up a sweat when I’m scrubbing. Rubber gloves on. Here I go! UPDATE: I tried this for a month and sorry to say, it did not work. I do love taking my walks almost every day and going to qigong class twice a week. But do I like cleaning the bathrooms and floors every week? No! Have I swept the front walk? Again, no! Alas, on to brainstorming more ways to get exercise. 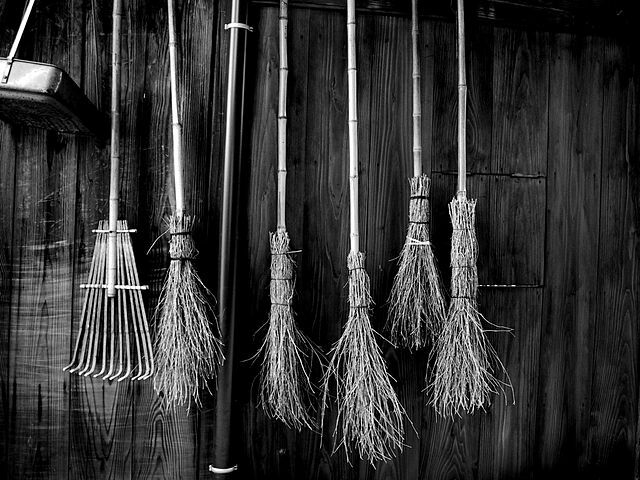 Brooms photo is by jam343.